Golcar were understandably nervous going into the 2005 season opener against Kexborough; they were back in the Drakes Premier Division and knew that they needed to build on the standards they had set the previous season. It was a tougher competition and captain Dave Robinson was one of the most apprehensive as the season began: “I was unsure what we would find and what the strengths of the other teams would be like”. The Lilies entered the 2005 season with a much-changed side from that of the previous year. Opening batsman John Cooper had announced his retirement after 37 seasons at the club and hard-hitting middle-order batsman Atul Bedade, who played One Day International cricket for India, had also played his final match at Swallow Lane at the end of the 2004 season. These were big gaps to fill but Golcar had also been active in the transfer market in the close season. All-rounder Steve Whitwam returned to the club after four seasons at Scholes and the Victorian Jeremy Brown had also been brought in as the club’s overseas player. Both players would make an immediate impact. The match itself only just went ahead. Traditional early-season conditions struck as debutant Jeremy Brown recalls. “My first memory is that it was cold and it had been raining overnight so we weren’t sure whether we were going to get a game in”. West Yorkshire proved to be a little different to Melbourne! Despite a wet outfield, the umpires decided that the match could get underway. Dave Robinson lost the toss and Golcar were inserted into bat, unsurprisingly given the damp conditions and the overcast skies. The Lilies lost Brent Walker early on and a nervous Jeremy Brown, playing his first innings for Golcar, strode in to partner Steve Whitwam. “I did feel a lot of pressure for the first game. I’d played a practice match the week before and I had a bit of a shocker. I think I made 6 and got smashed around a bit when I bowled. I got a full toss to get off the mark so that made life a bit easier”. The pitch surprised everybody; despite the wet conditions it turned out to be a good surface to bat on as Steve ‘Cobber’ Whitwam recalls, “I remember telling myself as soon as I got out there to get onto the front foot to cancel out as much swing or uneven bounce as possible. It was a strange sort of pitch because it was wet and in April you expect a bit of uneven bounce. But it was a skiddy pitch, which made it quite quick and actually very consistent with bounce. It’s not often you get a pitch like that so it was a pleasant surprise”. Despite the nerves of the occasion and the uncertainty over the pitch, the partnership soon began to blossom. Whitwam played an array of drives through the offside, particularly through the cover region while Brown was the prime aggressor in the stand, launching several pull shots into the houses nearby. With typical Australian confidence he made his intentions clear to Whitwam during the partnership. “He told me at one point that he wanted to park a particular bowler at one stage, which in Australia means hit him into the next park. He ended up doing it the next over. He played with a lot of confidence. I have never seen anyone play the pull shot like he did that day, he did it with such ease”. Both players grew in confidence as the partnership began to develop and Brown was aware that the tempo needed to increase. “Cobber started to play slog sweeps, a few of them going for six and we soon realised that we were going to need a big score, probably more than we thought at the start. The boundaries on one side were really short; it was a smaller ground than anything I had played on before”. Whitwam departed in the 37th over and admitted to being dissatisfied despite his century, “I was disappointed not to get more. I always try to make the most of my chances when I get in, I think I missed out on a big one”. After Whitwam’s dismissal Brown became even more aggressive, smashing the ball to all parts in the last 10 overs. He finished on 174 not out as Golcar reached 318 for 6 off their 50 overs. Brown knew that his work for the day didn’t end there, however. “We knew they had a couple of good players at the top of the innings so we needed to bowl well. I took the new ball which was something new for me because I don’t do a lot of bowling back home”. Despite his lack of bowling, Brown surprised his teammates with the amount of pace that he was able to generate. Said Steve: “Jeremy bowled quite quick that day, which was a pleasant surprise. We didn’t expect him to be that fast. The rest of the attack didn’t bowl that well and at one point I remember being a little worried that they were going to knock the runs off, particularly when Richie Kapoor, their overseas player, got going. We didn’t help ourselves by dropping him four times! In the end it was a good job that Jeremy bowled as well as he did”. Led by Brown, who took 5 for 99, the Lillies were able to restrict Kexborough to 253 for 6, who upon realising that the total was getting away from them decided to play for a point by reaching 75% of Golcar’s total. 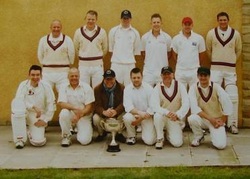 Steve Whitwam claimed the other wicket as the visitors won by 65 runs. It was the perfect start to the season and captain Dave Robinson was delighted with the performance of his new acquisitions. “Jeremy had been recommended to me by a teammate from Heckmondwike a few years ago. I hadn’t actually seen him play until that game so I didn’t really know what to expect. It didn’t take long for the apprehensions to go after his debut match. We knew what to expect from Cobber because we had played against him when he was at Scholes and he had already had experience of Premier League cricket. They were both fantastic that day”. The win was also a key moment for the Lilies’ season according to Whitwam: “It showed us that we were good enough to compete at this level and it gave us all a big confidence boost. We went from strength to strength from then on and the team gelled into a good unit”. Golcar went on to finish 5th in the Premier League that season - a fine achievement considering that it was their first season back in the top division. Whitwam enjoyed his best season at the club, achieving the all-rounder’s double of 1,000 runs and 50 wickets. Jeremy Brown also achieved the same double and finished as the club’s leading run- scorer and wicket-taker: he amassed 1,121 runs and picked up 67 wickets. Since his departure from Golcar he has continued to turn out for Carlton in Melbourne’s premier cricket competition.